Tiny Terror (3 g Shamexpress – Thora, by Pins) recorded a debut victory on Saturday 4 August at Te Rapa, albeit after an enquiry in the $25,000 Open 3YO 1100 metres. A nine length trial winner on the same course in July, Tiny Terror brought good form to the race, including a third to Von Trapp (Swiss Ace) – race favourite following his debut win and instigator of the interference. While Tiny Terror began well to situate second, Von Trapp worked from a wider draw to lead at the 700m and the early exertion could have proved a factor in him laying-out under pressure in the straight. Despite being inconvenienced, Tiny Terror continued closing the margin to a head at the line. Having ridden Tiny Terror in the trial, Shafiq continued his success with the Ballymore runners, after scoring recently aboard Fly To The Moon (Reliable Man) and Ali Baba (Savabeel) at Matamata. On Slow9 footing, in the race named ‘John Letts Guest Speaker 17th August’, Tiny Terror ran the 1100 metres in 1:07.6 and paid $10.90 & $2.20 on the NZ TAB tote. Purchased by owner Max Whitby for $70,000 at the 2017 New Zealand Bloodstock Premier Yearling Sale, from the draft of Blandford Lodge, Tiny Terror, a first foal, is from the family of Queensland Derby winner Brambles (Savabeel), and third dam Lady Aloof (Sir Godfrey) left five time Group One winner and Champion filly Slight Chance (Centaine). He is from the first crop of Windsor Park stallion Shamexpress (O’Reilly), himself a debut winning two-year-old and Newmarket Handicap (Gr. 1, 1200m) winner who has instilled plenty of strength and natural talent into his early winners. “He’s a very strong little horse and he trialled up very well (two wins and a third),” said co-trainer Pam Gerard. Given that three of his rivals had already won races, it was very good first up performance by Tiny Terror, and a timely win for Whitby, who sadly lost his wife, Jennifer, a day earlier. No Fuss Gus (Savabeel) was a winner for Whitby in three starts and stakes placed when third in the Wellington Stakes (Gr. 3, 1600m) prior to being sold to Hong Kong, and As You Will (Mastercraftsman) finished second in the Sarten Memorial (Gr. 2, 1400m), from a handful of starts, before he too was sold to Hong Kong. Tiny Terror was strapped by Pavin Kumar. Also on the programme, in the Open 1200 metres, Resurrect (Shinko King) followed a last start third on the course with a second to dual Group Three winning sprinter Julius (Swiss Ace). 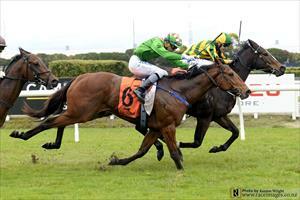 He had also finished second to Group One placed Ferrando (Fast ‘N’ Famous) over 1200 metres last December at Te Rapa.